Indeed, it is by the magnificent Lac de Sanguinet (a natural freshwater lake), on the border of the Landes and the Gironde departments, that the Les Oréades campsite, a peaceful family campsite enjoying a multitude of benefits, is located. Open throughout the year, this campsite turns out to be an ideal leisure location for anyone wishing to spend their holidays in the Landes department. It is a stone's throw away from the ocean beaches and halfway between Biscarrosse and the Arcachon Basin. 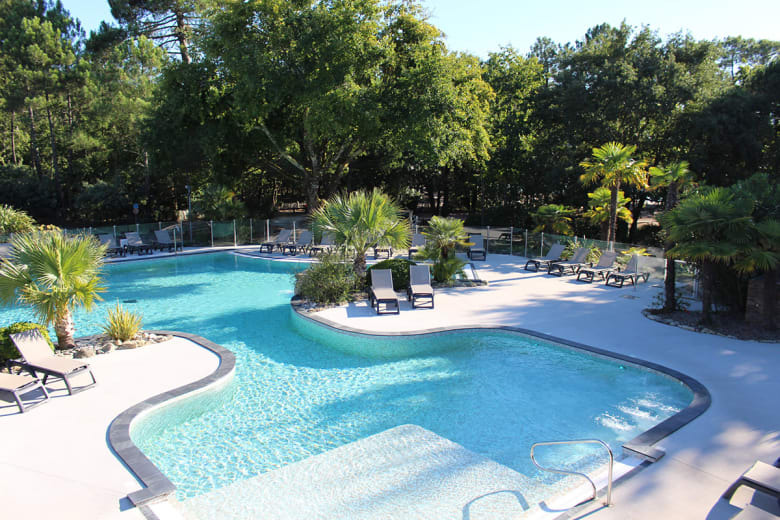 Amongst the numerous benefits of this residential leisure site, its environment and its geographical location can only seduce holidaymakers looking for a top-of the-range campsite in the Landes department. Bordering the Lac de Sanguinet, which is also known by the name of Étang de Cazaux et de Sanguinet, the Les Oréades campsite is indeed situated hardly 50 metres from a delightful fine golden sand beach. The closest beaches to the Landes coast are around twenty kilometres from the campsite. Nestling in the heart of a green oasis and surrounded by a forest of pines and firs, which is indeed typical of this region, the Les Oréades campsite has a large range of accommodation available, which it is possible to hire for the night, the week or the weekend. 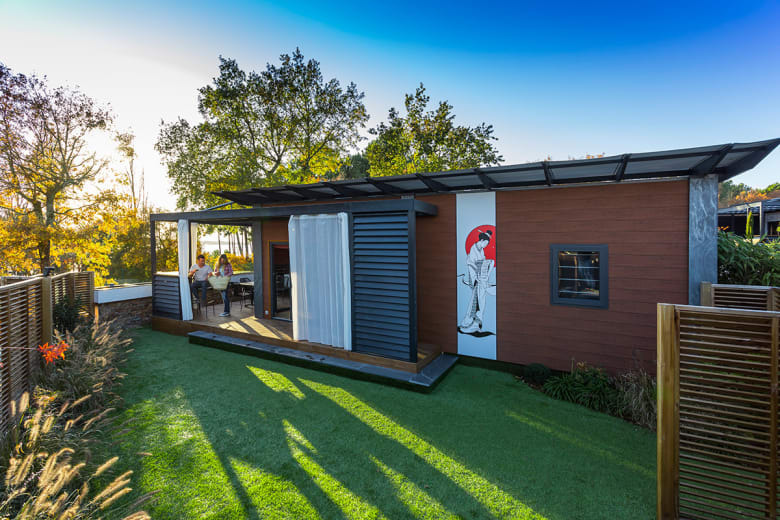 Being able to accommodate from 1 to 6 people, depending upon their layout, these mobile homes are located on plots with areas varying between 100 to 225 m²! Comfort and intimacy are ensured, and this is all the more so as particular care has been taken with landscaping pitches. For those who desire to use them, the Sanguinet campsite offers the services of a hotel. Breakfast and restaurant services may thus be included within your reservation! Open to all holidaymakers, the Table du Domaine, the restaurant on the Les Oréades campsite, offers seasonal cuisine to savour within warm surroundings. 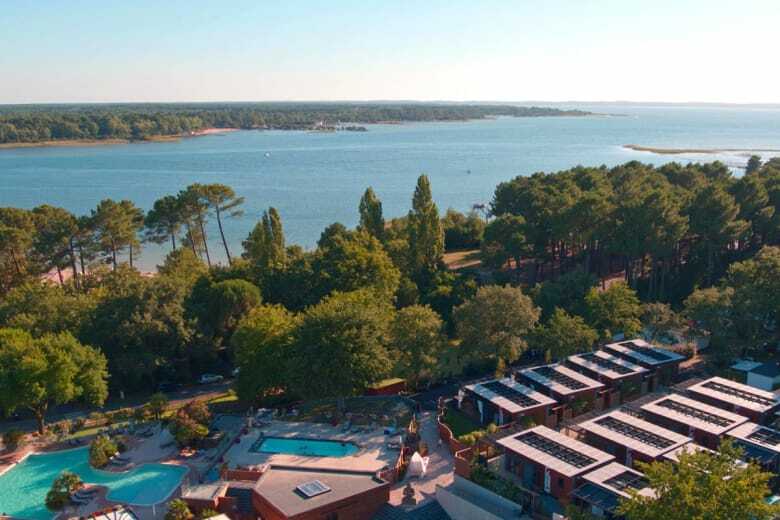 Although the peace and tranquillity, which are features of this Landes campsite, allow you to spend a restful stay by the water, for all that there is no shortage of leisure activities for holidaymakers. The Les Oréades aquatic park is thus, without doubt, the most popular area on the campsite. This is made up of a very beautiful swimming pool lagoon, a paddling pool and a children's splash pad. Arches and water pistols, animals on springs and water buckets thus all allow the very young to discover the joys of water completely safely. It is also worth noting, whilst on the subject, that swimming is supervised by a lifeguard. Moreover, a balneotherapy area complements the aquatic park of the Sanguinet campsite. Its pool equipped with hydrotherapy benches and its swan necks allow everyone over 18 to take advantage of delightful moments of well-being and muscle toning. There is a games zone which is exclusively intended for children. With its swings, trampolines and other slides, they have plenty of ways to have fun! It is worth noting that there is also a mini-farm accommodating a multitude of animals, such as rabbits, on the site, plenty to fill the very young with wonder! Finally, for sportsmen and indeed sportswomen, the Les Oréades campsite has plenty of dedicated facilities, such as a tennis, badminton and volley ball court and a football pitch. On-site, there is also an area for playing boules, as well as a bicycle hire service available. Spread over an area of 55 hectares, the Lac de Sanguinet is one of the largest lakes of the in the Côte d’Argent area. Straddling the departments of the Landes and Gironde departments, the lake accommodates a multitude of nautical activities, such water-skiing, windsurfing, sailing, barefoot water-skiing, wakeboarding, wakesurfing, stand up paddle boarding, and other activities. You can also do scuba diving, an activity which permits the discovery of numerous archaeological sites immersed at the bottom of the lake. Occupied since the sixth century BC, the Sanguinet site is indeed today a hot spot for underwater excavations in the region, the town also houses an archaeological museum. This, in particular, displays a multitude of objects which which have been brought back up to the surface, such as pottery, tools, jewellery, or even more surprising canoes dating back to the prehistoric era. Around Sanguinet, many other significant tourist sites await holidaymakers. The Atlantic Ocean is ten minutes by road, and the Arcachon Basin and the Dune du Pilat (Europe's tallest sand dune) are situated around twenty kilometres from the campsite, as are the Lac de Biscarrosse (Biscarrousse lake) and its famous seaplane museum. The Landes forest is crossed by countless hiking paths and other cycle routes. So many activities and places to discover whilst staying at the Les Oréades campsite in Sanguinet!